Over the 25 years or so that I’ve been reviewing Genelec products, I’ve always been impressed with the way this forward-looking company have maintained their edge by choosing different technological and ethical paths to most other monitor manufacturers. For example, sustainable production with minimal waste and low energy consumption has always been a company focus, and their products are designed for very long lives. On the technical side there are countless examples of innovative thinking, but perhaps one of the most relevant to this review was Genelec’s decision, in 1996, to construct speaker cabinets from recycled aluminium. This was revolutionary at the time, but has proved a hugely successful move. With its unusually rounded, almost bulbous form, Genelec’s instantly recognisable cast-aluminium cabinet is the brainchild of a Finnish industrial designer called Harri Koskinen. But the project was about a lot more than just the visual aesthetics; it brought several important technical benefits, too. For a start, it heralded the integration of Genelec’s proprietary Directivity Control Waveguide (DCW), which shapes the baffle itself into optimised waveguides for the drivers. The rounded cabinet form also minimises edge-diffraction effects, a feature Genelec have christened the Minimum Diffraction Enclosure (MDE) concept. Moreover, the inherent strength of cast aluminium facilitates relatively thin cabinet wall thicknesses with little requirement for internal bracing, maximising the internal volume and minimising cabinet vibrations. Aluminium also provides excellent heat management for the electronics and drivers. All of these benefits are present in the current 8000-series range of monitors, many of which also feature sophisticated DSP technology such as Genelec’s Loudspeaker Management (GLM) and Smart Active Monitor (SAM) systems, for remote control and automatic room-alignment EQ, respectively. Most of the 8000-series monitors are two-way systems, with vertically aligned drivers in the familiar woofer-tweeter combination. There’s nothing wrong with that, of course — it’s a familiar setup for very good engineering and marketing reasons — but there are practical limits to the sound quality that can be achieved with this configuration, because each of the two drivers is required to deliver a linear performance over five or six octaves. It is generally recognised that a higher level of performance can be obtained by employing a three-way architecture, which allows the bandwidth handled by each driver to be smaller. This approach brings a variety of benefits, including better matching of dispersion angles between drivers through the crossover regions, lower intermodulation distortion and better power handling. Genelec have long employed this approach very successfully in their larger monitors, but the extra cost, complexity and parts count makes it difficult to build a compact three-way monitor. 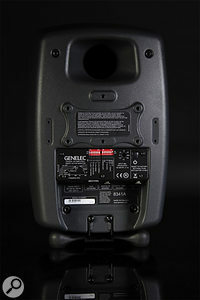 However, Genelec solved that problem in 2010 with the launch of their 8260A model, reviewed in SOS January 2011. Although this looks much like all the other 8000-series speakers, it is actually an ingenious three-way monitor featuring a brilliantly conceived dual-coaxial tweeter/mid-range unit. It took the company three years to perfect this unique dual-coaxial driver, in which a centrally mounted 20mm (0.75-inch) aluminium tweeter is integrated seamlessly with a 130mm (five-inch) mid-range driver, the latter’s cone and inner suspension forming a cohesive waveguide structure. Dual-concentric or coaxial drivers are not new, of course, and the roots of the concept can be traced back to the early 1940s — but although it’s an attractive notion for speaker designers because it brings a number of worthwhile benefits, it is not an easy configuration to master in the engineering sense. One of the key benefits is that the sound of both drivers emanates from a single point rather than from an array of separate drivers spread out across the baffle. Generating sound from a point source inherently provides a sharper and more stable stereo image with a larger listening ‘sweet spot’, and it is thought this arrangement reduces listener fatigue because the source location remains constant regardless of any head movements from the listener — something which may not be the case with more traditional speaker designs. It also has the advantage that the speaker’s off-axis sound projection remains a lot more consistent across the frequency spectrum than is usually possible with spaced drivers. Loudspeaker specifications usually focus on the on-axis frequency response, but actually the off-axis response is just as important and explains why different monitors sound so different in the same room, even though their on-axis responses might appear identical. The fact is that most of the sound energy within a listening room comes from the speaker’s off-axis sound reflected from the room’s boundaries; if the off-axis response is very uneven, the reflected in-room sound will be tonally coloured and that will affect our perception of the speaker as a whole. Historically, the earliest dual-concentric loudspeaker systems evolved as full-range two-way configurations, integrating a tweeter within a woofer in some way. Some designs suspended the tweeter in front of the woofer, while others mounted the tweeter behind it, ‘speaking’ through a horn passing through the centre of the woofer’s voice coil. Later, the introduction of more powerful magnetic materials made it possible to build high-efficiency tweeters compact enough to sit directly within the voice coil of a woofer. However, one problem commonly found with this arrangement is called ‘Doppler distortion’, where the wavefronts produced by the tweeter are essentially modulated by the independent and relatively large movement of the woofer’s cone. In effect, the HF wavefronts get an extra unwanted ‘push’ from the woofer, altering the speed of the radiating sound wave and creating small Doppler shifts: a form of intermodulation distortion that manifests itself as tiny pitch variations. 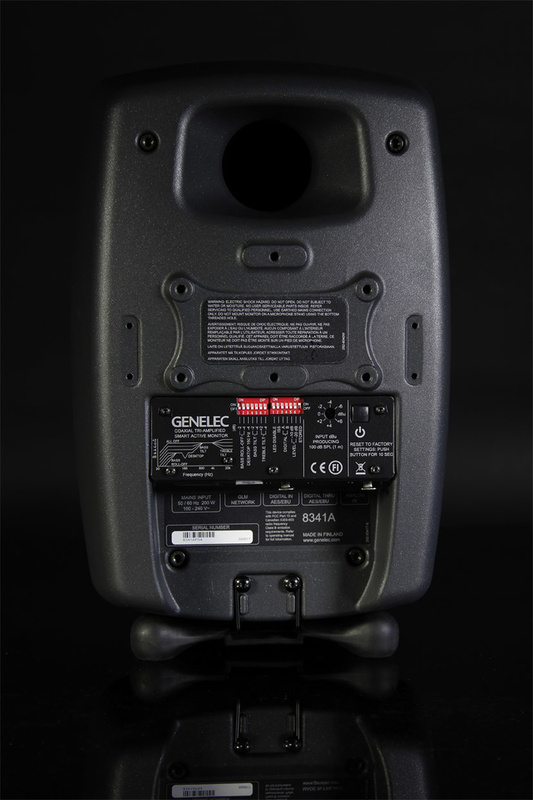 Genelec’s dual-concentric design stems from original research dating back to the 1990s, but the specific development of the coaxial driver employed in the 8260A started in 2007, and integrates a compact tweeter with a five-inch mid-range unit. This configuration all but eradicates the Doppler distortion problem and, as there is no physical gap between the tweeter and mid-range diaphragms, there is no discontinuity for the radiating wavefronts either. Also, the shape of the mid-range cone acts as a waveguide for the tweeter, helping to match their dispersion through the crossover region. This point-source conundrum was eventually resolved four years later when, in 2014, Genelec launched the improbably cycloptic 8351A monitor speaker. I remember clearly the first time I saw this uniquely styled monitor; it was at the AES Convention in Los Angeles in the Autumn of 2014, and it was quite a shock because the 8351A looked like nothing that had ever gone before! My mind contemplated the possibilities: some weirdly demonic creation of a wild-eyed Finnish scientist unhinged by the profound lack of sunlight in his native land and fuelled by an excess of Olvi beer? An eerie genetic experiment involving an 8000-series monitor and an Auratone maybe? I’m blaming such uncharacteristic flights of fancy on jet lag and a low blood-sugar level... Thankfully, my senses quickly returned after I settled into a comfy seat in Genelec’s demo room to hear the 8351, whereupon it became immediately obvious that this was something quite special: a truly compact nearfield monitor,with remarkable bass extension, pin-sharp imaging, and the kind of mid-range resolution and clarity that only a good three-way design can deliver. You can read a comprehensive review of this genuinely ground-breaking monitor speaker by my colleague Bob Thomas in SOS August 2015, but perhaps his concluding summary really says all that needs to be said: “By any measure, the 8351A achieves a level of performance that more than justifies its price. Its outstanding stereo imagery, clarity, resolution and transparency together with its transient delivery, bass detail and extension prove, to my ears, that this innovative three-way, coaxial monitor design really delivers the goods.” I couldn’t have said it any better myself! In brief, this revolutionary design places the dual-concentric tweeter/mid-range unit from the 8260A slap-bang in the centre of the baffle, the whole of which is shaped to serve as a waveguide. The low end is generated by a pair of bespoke bass drivers which have an oval or ‘race-track’ shape — their actual measurements being 8.5 inches wide by four inches high. These are mounted behind the main baffle, directly above and below the dual-concentric unit, with their sound exiting through crescent-shaped slots at the top and bottom of the baffle (as well as via a rear-panel reflex port) in such a way as to generate a circular wavefront emanating from the same acoustic centre as the coaxial driver. This most ingenious and innovative arrangement establishes the highly desirable point-source principle across the entire audio spectrum in a really elegant way, and by employing the whole of the front baffle as a waveguide for the mid-range/tweeter, the directivity is controlled to a much lower frequency than is possible in conventional designs, where much of the baffle is occupied by a large bass driver. The 8351A really is a marvel of advanced engineering and imaginative packaging and, while the visual aesthetic takes some getting used to, the sound quality is quite remarkable. The point-source speaker brings with it many practical benefits. One of the perennial ‘issues’ I encounter in project and professional studios alike is the fashion for placing traditional monitors, with vertically aligned drivers, on their sides. This ‘landscape’ arrangement causes several problems, starting with the fact that the frequency response of the monitors throughout the critical crossover region (which typically coincides with the vocal range) changes dramatically with small lateral movements of the listener due to comb-filtering effects from the varying distance between the ear and each driver. The precision and stability of the stereo imaging is also degraded significantly, and the HF dispersion is likely to be considerably narrower than the designer intended. In short, this positioning seriously compromises the monitor’s performance. However, this problem doesn’t exist at all for the Genelec 8351A, because it behaves as a point-source speaker. Highs, mids and lows all effectively radiate from the exact centre of the baffle, and so the performance and frequency response are essentially unchanged whether it is used in portrait or landscape orientations; there can be no interference effects between the drivers to degrade the sound quality or stereo imaging for off-axis listeners. To facilitate landscape or portrait orientations, the familiar Iso-Pod stand can be attached either to the short or long sides. Another significant advantage of the point-source design is that the monitor speaker can be positioned much closer to the listener than is possible with a conventional speaker of similar size. In a conventional design, with vertically spaced drivers, the listener has to be a certain minimum distance away from the baffle in order for the sounds from each driver to merge correctly. Again, this is not the case for the 8351A because the coaxial mid-range/tweeter driver and the symmetrical coincident wavefront radiated by the twin woofers ensures that their relative balance and phase relationships remain unchanged almost regardless of the listener’s proximity. Genelec state that the minimum listening distance for the 8351As is 0.4m, and to put that in context, the minimum listening distance for the equivalent-sized 8050 two-way monitor is 0.7m — nearly twice as far! The ability to work in the ultra-nearfield can be hugely advantageous when the listening room’s acoustics are sub-optimal. Nearfield listening inherently reduces the significance of room reflections, and the closer you can get to the monitors, the less the room’s acoustics matter! Physically, the 8351A is quite large, at 452mm in height, and inevitably, many high-end customers requested smaller models with the same three-way point-source technology, but it wasn’t a simple case of just scaling everything down a bit! We’ve had to wait until the start of May this year for Genelec to perfect a smaller sibling — only to discover that the Finnish boffins have created not one, but two smaller versions. Collectively called ‘The Ones’, Genelec’s new additions create a trio of point-source, three-way monitors. Maintaining Genelec’s model-numbering conventions, the new mid-sized 8341A model has a 20-litre cabinet volume and is about the same size as the 8040A, while the smallest 8331A has a 12-litre cabinet and is a few millimetres taller than the 8030A. In fact, the 8331A holds the record as the world’s smallest three-way monitor. In common with their larger 8351A sibling, these new speakers feature both analogue and digital connectivity, plus networking options for use with Genelec’s GLM and SAM control systems.Both of these new monitors share all of the 8351A’s design concepts, employing rear-ported aluminium cabinets, twin ‘race-track’ bass drivers mounted behind the front baffle radiating through slots top and bottom, and a dual-concentric mid-range/tweeter at the centre of the ‘MaxDCW’ waveguide constructed from the entire front baffle. Also, just like their bigger sibling, both new models feature sophisticated DSP crossovers, system protection, and equalisation with Genelec’s Loudspeaker Management (GLM) and Smart Active Monitor (SAM) technologies. Amplification is ultra-efficient and powerful Class-D throughout, and all of the electronics are designed and manufactured in-house. In developing these new smaller models, the Genelec R&D team had to rework every aspect of the design, from the aluminium cabinets up. New bass drivers were designed for each model, with dual 6.6 x 3.5-inch bass drivers for the 8341A model and 5.1 x 2.6-inch units for the 8331A. One of the interesting challenges of designing a ‘race-track’ bass speaker is that the cone is inherently unbalanced, since there is more mass along the long edges than the short ones. This creates a tendency for unwanted rocking motions, but Genelec control this with a cunningly shaped roll surround which features a significantly different profile on the long axes compared to the short axes. Although it’s not immediately obvious to the eye, the dual-concentric mid-range/tweeter unit employed in the 8341A and 8331A models is also a brand-new design. While the tweeter is still a 20mm (0.75-inch) element, with a response extending to 37kHz, the mid-range unit is smaller and measures 90mm (3.5 inches) in diameter. Although based closely on Genelec’s original coaxial design, the most significant difference in this new device is that both the mid-range and tweeter motor assemblies share the same magnet core, rather than using completely separate magnetic structures — a design iteration which was instrumental in enabling the coaxial unit to fit in the very restricted space available in these two smaller monitors. The technology, connectivity and setup processes are more or less identical for both new monitors, but naturally they differ a little in their specifications. The larger 8341A incorporates a very generous 250W amplifier for the bass drivers, and provides 150W each for the mid-range and tweeter, crossing over at 500Hz and 3kHz. This allows the system to achieve a bass extension down to 38Hz (-6dB) and a maximum SPL of 110dB. A good indication of the way this monitor technology has been optimised is that, despite its smaller size, the 8341A gives very little away to its larger sibling, which manages only 1dB more SPL and a 32Hz bass extension. Rear-panel connectivity provides separate XLRs for analogue and digital input signals, with a digital loop-through output on another XLR allowing an AES3 source to be passed on to a second monitor, and two RJ45 control network ports. In comparison, the smaller 8331A model features a 72W bass amplifier and twin 36W amps for the mid-range and tweeter, with the same crossover frequencies, while the bass extension is given as 45Hz and maximum SPL as 104dB. But don’t be misled by these figures; in real-world nearfield/desktop situations this very compact monitor goes more than loud enough, and has a greater bass extension than most similarly sized monitors. Not surprisingly, the reduced cabinet size of the 8331A means there isn’t space for separate analogue and digital sockets, so a single XLR accepts either format. However, a digital loop-through output is still provided on a second XLR, and the two RJ45 control network ports are present, too. Input selection is automatic, with the AES3 signal having priority, but the monitors can also be configured for a specific input format using the GLM control software, if preferred. Sample rates of 32-192 kHz are supported, at 16- or 24-bit word lengths. The appropriate AES3 channel can be selected either using DIP switches on the rear of the monitor, or the GLM software. The nominal input sensitivity is the same for both the 8341 and 8331 monitors: 100dB SPL at one metre is achieved with an analogue input of -6dBu or a digital input of -30dBFS. However, a rear-panel trimmer and a pair of DIP switches accommodate any input level from +36dBu to -6dBu (for 100dB SPL at one metre). The intention is that the speakers should be configured using the well-established GLM room equalisation system, but in a long Genelec tradition, the rear panel still features a suite of DIP switches for basic configuration options. These include facilities for adjusting the bass roll-off (-2 and/or -4 dB), controlling a desktop resonance peak at 150Hz, and tilting the bass or treble responses (-2 and/or -4 dB again). A second bank of DIP switches disable the front panel warning LED, enable Intelligent Signal Sensing (see below), select the left, right or sum of AES3 channels, attenuate the input level by 10 or 20 dB, and select either the DIP switch settings or the internally stored GLM calibrations. Both monitors incorporate universal power supplies which can accept 100-240V AC, and feature ‘Intelligent Signal Sensing’ to power the speaker down to a ‘sleep’ state automatically when not in use (the wait time can be set in the GLM software). The front-panel LED lights green for normal operating conditions, but blinks rapidly when the monitor is being addressed by the GLM software, and slowly when in the ISS sleep state. Blinking red or yellow indicate protection conditions (overload and overheat, respectively), while constant red means the monitor is muted, and constant yellow means the monitor is not enabled in the current control group. As with other GLM/SAM monitors, all of the clever driver equalisation and protection, as well as the overall room equalisation, is performed in the digital domain using floating-point arithmetic at 64-bit resolution. The DSP processing affords the GLM software with the capability of allocating and configuring up to 16 parametric filters and two HF and LF shelving filters to correct in-room response anomalies. Interestingly, all of the equalisation is configured using linear-phase filters so that the electrical input waveform translates as closely as possible to the generated acoustic wavefronts, and the processing latency is both very short (less than 4ms) and constant at all frequencies above 100Hz (it increases below that, in common with most loudspeaker designs). Immediately following their global launch I was supplied with pairs of both the 8341A and 8331A, and I’ve enjoyed spending several weeks listening to them. They are extremely impressive, and tonally it’s quite difficult to tell the two models apart, such is the consistency of the ‘family’ sound. Of course, the larger 8341A can go significantly louder, and has a noticeably deeper bass extension when presented with suitable material, but much of the time, I struggled to tell which monitor pair was selected. I usually perceive a slightly mid-forward sound from most compact Genelec speakers, despite their demonstrably flat on-axis responses. However, these new monitors seem to be balanced very neutrally in comparison to my usual reference monitors, and I wonder if this is due in part to the very well-controlled off-axis responses that the point-source configuration enables. Moving around in front of these monitors, the consistency of sound is extraordinary. Play pink noise over conventional monitors and move vertically in front of them and you will generally hear quite obvious tonal changes due to comb filtering from the spaced drivers. That doesn’t happen at all with these Genelecs, and the benefit is a larger and much more consistent listening sweet spot than can usually be achieved. Stereo imaging is pin-sharp and very stable with both models, too, and good recordings portrayed excellent stage depth and width, with individual sound sources acquiring an almost 3D solidity. For the cabinet sizes, the bass is unusually extended in both monitors thanks to some DSP equalisation, but crucially, this has not been achieved at the expense of control or accuracy. These are genuinely truthful and precise monitoring tools, and I had no difficulty balancing or equalising bass instruments. The bass extension of the small 8331A is actually quite uncanny! My usual desktop monitors are located about 1.5m away from the listening position, but I deliberately set the 8331As up at just 0.4m to test Genelec’s minimum listening distance recommendations. This ultra-nearfield scenario would be quite appropriate for a lot of musicians working at home where space is at a premium, but it would only be appropriate with the smallest of conventional monitors. The benefit of Genelec’s point-source designs makes it possible to have a full frequency range and an almost total exclusion of the room sound, with headphone-like clarity and resolution but much better stereo imaging. Of course, one potential problem when sitting so close to the monitors is that amplifier self-noise can become audible as a constant background hiss, but I couldn’t hear any hiss at all from the 8331As even at this close position, and the specifications claim an A-weighted self-noise at 1m of 0dB SPL! The larger and far more powerful 8341A is specified with a self-noise of less than 3dB SPL A-weighted, which is still inaudible at all practical listening distances. Overall, I found the 8341A and 8331A to be outstanding reference monitors, and I am completely bowled over that this level of sound quality can now be achieved from such compact boxes. Judged by their bass responses alone you’d be forgiven for thinking these were much, much larger than they actually are, and yet their stereo imaging has the precision normally associated with smaller designs. 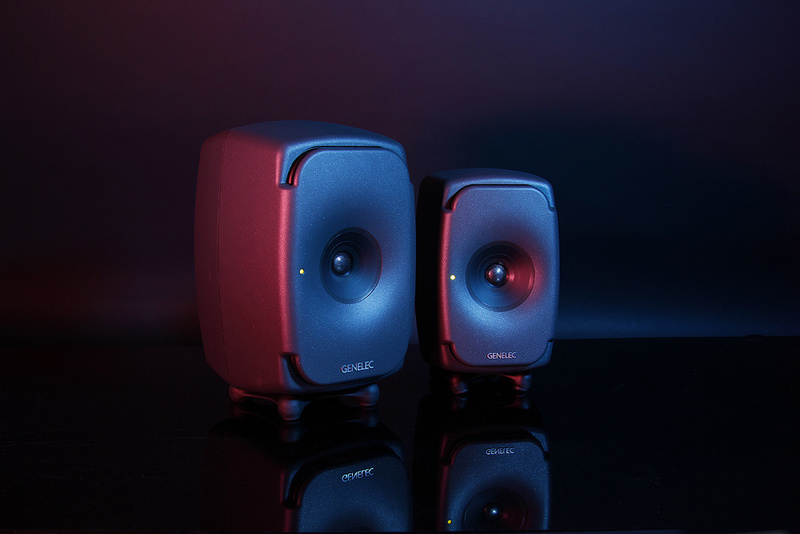 They also deliver the transparency and neutrality expected of a really good three-way monitor speaker, but their compact form allows them to be used in ultra-nearfield situations and in either orientation without compromising their tonal accuracy. In a good room, the GLM equalisation feature adds a welcome uniformity to the on-axis frequency response, while in a bad room, the ability to work very close allows most of the room effects to be beneficially negated. Not surprisingly given the level of technology and sophistication on offer here, the 8341A and 8331A are pretty expensive monitors — and seem all the more so given their compact size. But that technology and sophistication makes them unique and, in my view, easily justifies the asking price. There is nothing else on the market at all that comes anywhere close to matching the size/performance ratio, let alone the compact, three-way, point-source format. For these reasons I think I’m entirely justified in suggesting that these new monitors are genuine game-changers, and that we are in ‘product of the decade’ territory here! Genelec have set a new — and very high — benchmark for compact reference monitors. There is nothing on the market that is comparable. There are no other three-way monitors as compact, and none that work as full-range point-source monitors, either. The world’s smallest three-way monitors. Point-source sound generation for precise and stable stereo imaging and very low fatigue. Very neutral and natural balance with excellent resolution. Ability to work at unusually close distances, which helps in poor rooms. Can be used vertically or horizontally without compromising sound or imaging. Generous but perfectly controlled bass extension, surpassing any expectations from the cabinet size. GLM room equalisation and SAM system control features. The cycloptic styling takes some getting used to! Genuinely unique and ‘game-changing’ high-end reference monitors that deliver three-way, point-source technology in a compact project-studio-friendly format. 8331A £3898, 8341A £4918. Prices are per pair, including VAT. 8331A $4990, $6590. Prices are per pair.